All right, why didn’t anyone ever tell me that William Shatner REALLY IS Captain Kirk? All these years of assuming he’s just pretending, when in reality he’s an evil battle genius who’d rather take a knife in the back than surrender! 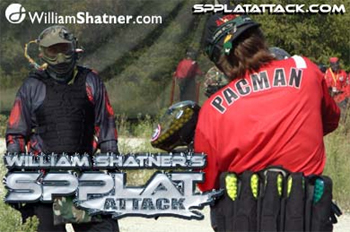 William Shatner plants his flag as the king of celebrity cool in William Shatner’s Spplat Attack!. 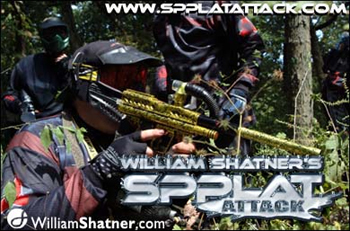 One paintball course, 3 teams (Federation, Borg, Klingon), 1500 paintball warriors in a massive charity event that rips the seams off celebrity pomposity and beams cultural icon William Shatner down to earth to lead his fans into actual battle. Thankfully, some genius had the wit to film and wrap it up in a neat little docutainment package on video and pay per view. It’s a clear Illinois morning when Shatner parachutes into the middle of one of the world’s premiere paintball course. Upon landing, he immediately takes charge of his troops. As Captain and supreme commander of the Federation team, his mission is to lead the Federation red shirts to victory over the blood thirsty, paintball veteran Borg and the foolishly run Klingons, commanded by schlocky radio DJ Mancow. Spplat Attack is simply unreal, a weird and delightful display of film crossing over somehow into the real world. Armed with paint, Shatner doesn’t sit in some “celebrity tent” surrounded by agents and studio producers. Instead, even though the man is in his 70’s, he literally TAKES command, and races out onto the field to lead troops into battle. He’s on the front lines, blasting away at the enemy, wiping out more experienced players with the bat of a hand! There were no special privileges for the Supreme Shatner. Far from it! Instead, just like his alter ego Captain Kirk, Shatner charges in where others fear to tred, even when his men try to hold him back! Yet, like Kirk, even against impossible odds, somehow he succeeds. Every player on the field is gunning for Shatner, yet his crosses and double crosses keep the enemy guessing. With flawless and informed battle tactics he triumphs over infinitely more experienced and skilled forces with his hearty group of red uniformed paintball soldiers. 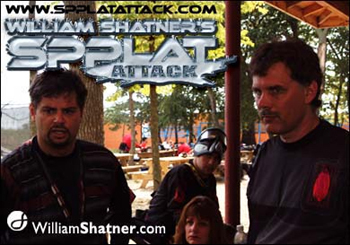 Star Trek fanboy or not, Spplat Attack is a must see. Shatner’s intentionally overblown persona is hilarious and entertaining. His voice-over is informative and riotous. His in-game maneuvering turns out surprisingly skillful and his tactics are curiously entertaining. Bill gets just as caught up in it as everyone else. He routinely shoots messengers in the back, solves problems with a paintball to the head, and threatens opposing commanders with a finger to their chest and combined the might of the Federation. But for my money, there’s just nothing like watching Captain Kirk take point to lead hundreds of armed soldiers in Federation uniform in a massive uphill lightning charge to assault a Klingon base. Those troops are living every kid’s dream, and Spplat Attack lets you hop right in beside them. Captain Shatner gives the orders and battle is joined. In the real world, as on film, he is the ultimate Alpha Male.